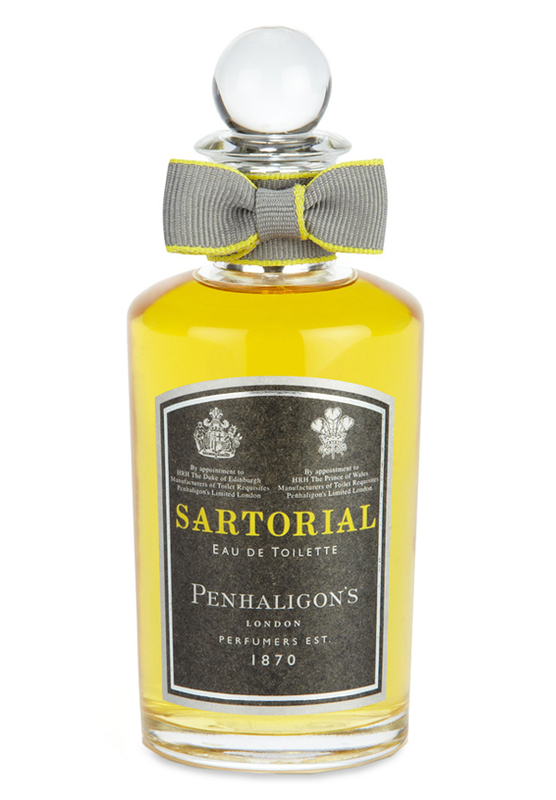 Penhaligon's say "A fragrance for a new generation of gentlemen, inspired by the scents of the workroom at Norton & Sons, bespoke Tailors of Savile Row"
There are 66 reviews of Sartorial. A pastiche barbershop foguere through and through. A combination of natural lavender and oakmoss with green synthetic aldehydes and a spicy backdrop of pepper and cardamom. Given the "everything but the kitchen sink" notes listed, you would think this would be a bit of a mess: instead, the scent is much more linear and straightforward. As it dries down, the spiciness intensifies and the leather comes forward, with very gentle notes of honey and powdery vanilla. Eau de Toilette fragrances are generally not my thing: the scent is far short-lived for me to enjoy. However, I find that they can be much sharper, more jagged and exciting while they are around. This is the case with Satorial: it doesn't project much and the longevity is 4-5 hours (2-3 as a skin scent) but it does have a lot of interesting bite. It's a masculine scent, more retrograde than modern. I find this to be good for what it is: at $35 for 1 ounce bottle it should be in the collection of anyone who enjoys an interesting take on a barbershop scent. It's shockingly straightforward and a bit weak but it's a very nice ride while it lasts. Here's my recommendation: You should have either Penhaligon's Sartorial or Maison Margiela's At The Barber in your cologne collection. These are so close that I believe one or the other doesn't add much to the mix. I'm guessing that whichever one you start with first, you'll fall in love, and then after getting the other, you'll prefer the one you've been using. I like them both, but I've had At the Barber for several months, sampled Sartorial, and concluded, based on price and scent, I'll just stick with the one I have. A straight-up homage to a previous designer release from 2003 (hint: tin can) this one is very likable based on the structure alone. It's a twist on the classic anise fougere a'la Azzaro and the aforementioned YSL juice. But for me, the balance is off and the heart becomes a one-note affair for so long that I just want it to be over by time the base is revealed. Well-made and sample-worthy, for certain, but I think this is done better, cheaper by others (see Pasha de Cartier). Sartorial seeks to replicate the smell of the back room at Norton & Sons Bespoke Tailor of Saville Row, and that's not to say Sartorial is recreating the smell it had in the 19th century, but the smell it has now, marrying this aura to a timeless barbershop fougère structure. Logically, it's going to take a decent number of synthetic scent molecules to replicate the smell of metal steam irons on fabric and silk sachets of lavender or heliotrope hanging from warm-pressed jacket pockets, but it appears Mr. Duchafour achieves success. I won't try to give a breakdown of what I smell compared to the listed pyramid for this reason, as it's just a hot mess of notes, but outside the impression of a tailor's workspace, I catch a spiky lavender opening, soapy neroli like an eau de cologne, cardamom, beeswax that distantly recalls the drydown of Chanel's Antaeus (1981), vanilla like what's found in the aforementioned Canoe, and a very complex base that stays light on it's feet. You get a slight talcum note but it's not on the level of a Brut (1963) or Wild Country (1967), while the usually-buttery oakmoss is countered by the synthetic metallic note in the top, making the musk, dry myrrh and cedar do the talking. Sartorial finishes like the antithesis of something such as cK Be (1996), being clearly the scent of a heteronormative upper-class man dressed "to the nines" leaving his favorite exclusive barber, rather than a gender-fluid barbershop fougère "for everyone" like cK Be has become. Despite this, Sartorial is not intimidating like a typical Penhaligon's scent can sometimes be, as it's all impressions and not assertions. Sartorial is lavender, vanilla, oakmoss, and beeswax absolute wrapped in cedar and tonka when you parse away the synthetic filler, and that's not bad; unexciting perhaps, but not bad. Whether or not you feel Penhaligon's has any claim to niche status or market is irrelevant to what they are and always have been: an old perfumer with long-held royal warrants that like Geo F Trumper or Ed Pinaud, has it's origins in high-end barber culture of the Victorian Age. Unlike Creed, Penhaligon's has never banked on the status of past clientele nor priced it's catalog accordingly, even if I wouldn't exactly call them affordable either, since you're going over 3 digits in price unless you buy "found" testers and the like. As for Sartorial itself, sales prove the validity of it's existence, like it or not. Ironically, replicating the smell of a tailor's room would turn away a true snob as they'd wish to avoid smelling like "the help", and that's a bit of tongue-in-cheek I can appreciate. I'm neither on the "for" nor "against" hype trains here, and see it as a nice barbershop smell with a bit of "movie magic" replicating the tailoring aesthetic; it's enjoyable for this reason but never going to be my signature. The infinitely better-crafted Rive Gauche Pour Homme (2003) already holds my heart as my ultimate barbershop fougère experience, and it doesn't need warrants or olfactory CGI to do it. Still, Sartorial is a very good fougère you won't regret picking up if you can dig the metallic "hot iron" vibe, and will make you smell like you're wearing your Sunday best, even if you're just in jeans and a t-shirt buying McDonald's. Sartorial is best-worn as a work scent or a dress-up event like a formal dinner with visiting family, or attending a wedding. Sartorial could also replace the long-gone Penhaligon's Racquets Formula (1989) as it's in that part of the family tree. Never challenging, always pleasant, with moderate performance and adequate sillage, Sartorial could easily be a work daily for a white-collar 9 to 5 guy who's more Men's Warehouse than Brooks Brothers, which is where I feel this fits the best. Starts off with a sweet and citrus twist on the mature, old-school, classic male scent. Very good projection lasts 3-4 hours. The drydown is sweet and musky with that old-school feel still coming through. I’m not a big old-school fragrance guy but this is pretty enjoyable. Longevity is good, lasts through the work day. 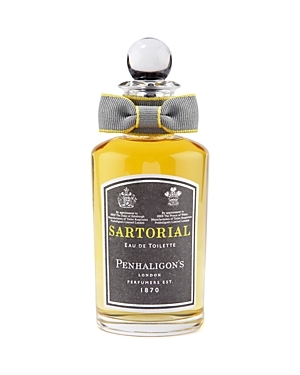 Penhaligon's Sartorial Eau de Toilette 3.4 oz. Penhaligon's to launch Sartorial scented Moustache Wax to coincide with "Movember"